Gratitude. This fills our hearts as we think upon the year 2017 to a depth we have never known before. 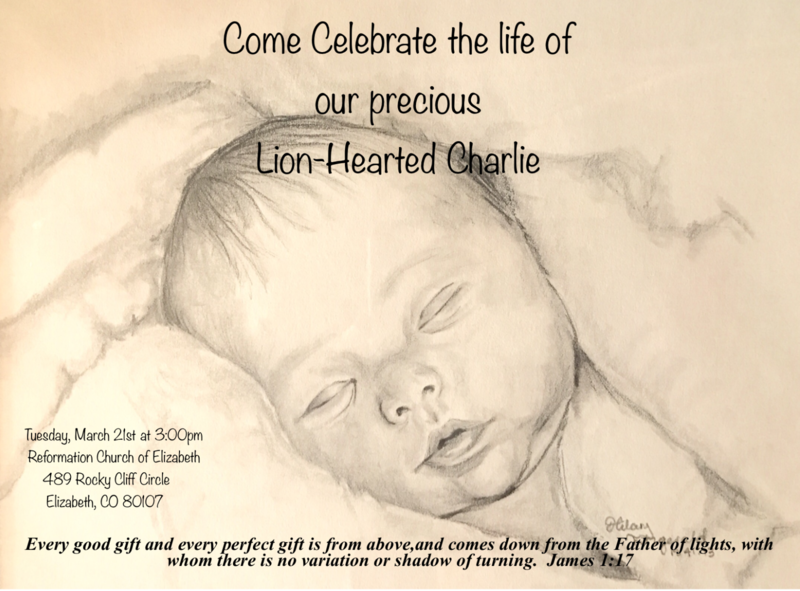 On March 16th our precious little boy, Charlie, entered the presence of the King. After a long journey of trying to get Charlie’s body to function properly he encountered yet another infection that ultimately ended his life here with us. We were grateful to spend Charlie’s final days as a family at home with him in our arms surrounded by extended family and friends. We held a celebration of Charlie’s life where each of our children gave a tribute to Charlie and the impact he had on them. The church overflowed with precious people from our family, our church, our community, the hospital, and even friends from far away that had labored in prayer for Charlie. I miss you deeply. My arms ache to hold your precious snugly frame. I miss your fluffy Mohawk. I miss your pudgy toes. I miss your beautiful smile and silly faces. I miss your ultra-flexible right leg. I miss kissing your plump lips and little ears. Charlie, you have changed me. You have given me a new strength, a renewed and emboldened vision for the future, you have given me so many new precious friends, you have taught me to communicate better, love more deeply, forgive more quickly. You have taught me to be a better mother and wife. You have taught me to pray and live in a more constant state of intimacy with Jesus. You have helped me to learn that with God there is nothing that can overtake us, nothing that can harm us, and absolutely nothing to fear. The deposits you made here are far-reaching, we will never be the same, I thank God for every second He gave us with you! Give Nana big kiss for me and we will walk forward with you having imprinted our hearts deeply my precious boy. In April our family traveled to Maui, HI for a time of rest, worship, healing, playing, and enjoying God’s marvelous creation. We loved being together and reflecting upon all of God’s faithfulness and mercy throughout Charlie’s short little life. We also spent time thanking God for all the ways many of you came alongside us which helped us endure the long and exhausting battle for Charlie’s life. There were so many things: many prayed fervently for Charlie and our family, helped make Christmas and other holidays special for our family as we were often separated and stretched, meals, gifts by mail, books to encourage our hearts, scripture, texts, emails, hospital visits, notes, anonymous support, monetary gifts, and physical help in our home! In May we celebrated Savannah’s high school graduation. It was a sweet time of remembering all that God has done in our precious girl throughout her 18 years! The joy, faith, and perseverance God has given this young woman is beautiful. She has continued to help her dad with his real estate business as well as being a huge help to the family. She recently passed the CO real estate exam and is now officially a realtor! 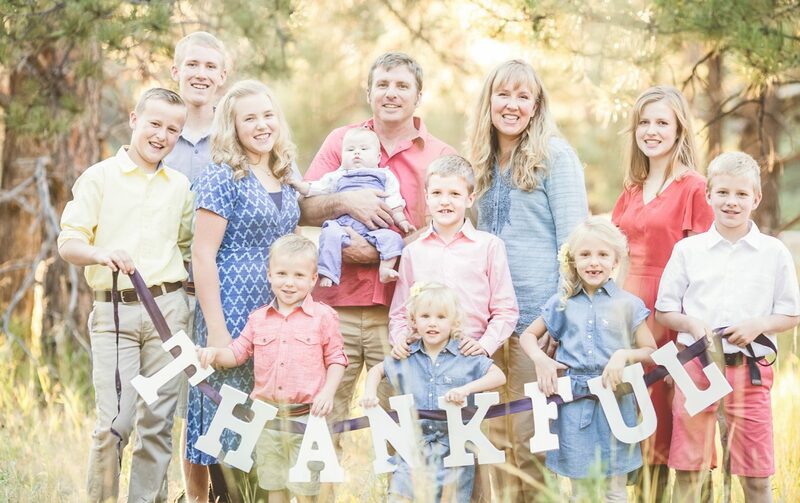 She enjoys photography, Bible journaling, babies, accounting, volleyball, piano playing, learning about natural health and nutrition, baking, and being mentored by her dad in business and by her mom at home. David (17) has had a fun and full year of working hard, running hard, and schooling hard. He has enjoyed running with the local high school Xcountry/track team. David enjoys building fences, laying flooring- especially tile, studying God’s word, playing the piano, singing, and running fast. Sarah (15) is our in-house nurse. She has enjoyed learning about more techniques and remedies for different maladies this year. If there is an injury or a sickness, Sarah is usually the first on the scene to provide excellent care and compassion. Sarah enjoys skiing, volleyball, hunting, being with cousins and friends, JESUS, studying the “Armor of God”, playing violin, singing in our Church Choir, cooking healthy foods, breeding dogs, fermenting foods, hunting, horseback riding, shooting, hiking, and caring for the bloodiest of wounds. Daniel (13) became our fourth teenager this month! He has done a lot of growing this year and threatens to outgrow all of us. He loved going hunting this year and harvesting his first deer. Daniel is our compassionate servant. He enjoys cooking, serving up a beautiful meal, biking, hunting, snuggling little ones, air soft wars, organizing, and reading. Luke (11) is our hard working cowboy. If he isn’t working alongside his dad or big brother then he will be found in the barn or on the back of his kind horse ‘Preacher.’ God has filled Luke full of life. He loves working with his hands, running, talking like Donald Duck, serving, biking, volleyball, horseback riding, caring for animals, smiling, making new friends, and hunting. Samuel (10) is our little scientist. He loves to read, learn and study new things. He loves our microscope, science books, and learning about ‘creation.’ We love hearing new facts and discoveries as he shares all the new things he has learned in a day. Sam enjoys reading, playing chess, learning how things work, answering hard questions, cooking, fishing, puzzles, exploring planets and stars, seeing microscopic life, and learning Bible stories. Naomi (7) is energetic and cheerful, always looking for ways to help and make things better. She enjoys her school but especially bible, math and science. She devours books and can be found whipping up a new Larabar recipe often! She enjoys dancing, swinging, singing, holding babies, drawing, cooking, shooting her bow, holding kitties, caring for puppies, building tree forts, and camping. Isaac (6) is completely thrilled if he has a frog in one hand and a snake in the other. He is usually found in his free time searching for a new critter, bug, or anything that might like to live in a pond or under a rock. He is a biking maniac and no sooner did he drop the training wheels than he started doing jumps and tricks on his little bike! Daddy’s boy. Isaac loves to read, snuggle, play in the woods, horseback ride, cheer on David at races, play air soft wars, color, and eat. Enid (4) usually has a baby doll in one hand and a big sibling’s hand in the other. She loves her brothers and sisters. She can be found in the middle of whatever they are doing. Enid enjoys riding her bike, coloring, doing puzzles, folding towels, helping bake, singing, dancing, snuggling pets, tea parties, and playing in the tree fort. More than ever Bob and I have been learning and experiencing the truth of the meaning of God’s names. As we have grieved, suffered, rejoiced, cried, laughed, mourned, celebrated: we have found these to be very TRUE of God our Father! Bob and I are grateful for the refreshment and renewal we have experienced in Christ this year. We celebrated our 20th wedding anniversary this year and we are amazed at how marriage continually gets sweeter and sweeter as the days go by, the trials are faced, and the milestones are celebrated. God truly is SO faithful! Charlie’s celebration was such a blessing to our family. Thank you to the hundreds of friends, family, and Charlie supporters for joining us at the celebration in person and the via livestream. Here is a link to the slideshow we showed at the funeral. We had a wonderful trip to UT and ID to be with family and friends. We met and were able to hug so many people that have helped carry us through their prayers, what a blessing! He ran to Jesus… Come and Celebrate! Charlie is home with Jesus and free! Our family has been honored and blessed by the love, prayers, care, and support poured in from each and every one of you! We are so grateful to have walked this beautiful journey with Charlie, and we will miss him much. 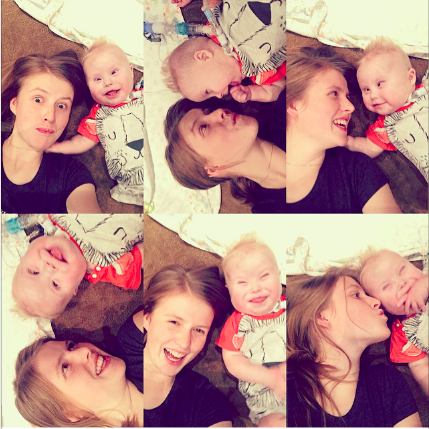 But we are so excited that he gets to worship his KING where meds, tubes, and pain do not exist! What a glorious place! Charlie was courageous and peaceful and fought like a true warrior to the end. We would love to have you come celebrate our sweet Lion-heart with us Tuesday, March 21st at 3:00pm ~ Reformation Church of Elizabeth (489 Rocky Cliff Cir. Elizabeth CO, 80107) We are working to set up livestream for those of you from afar, so stay tuned for details. With great Hope in Jesus and with absolute knowledge of what lies on the other side of the river of death I wanted to update you on Charlie’s situation. With a new added infection today and the digression of Charlie overnight, it has become clear today that we need to bring Charlie home to be where he is happy and with the people he loves quickly. Hospice will be helping us out in these, what appear to be Charlie’s final days. There will not be a final push to try to get his gut to work as this would be more detrimental to Charlie at this point. We sense a strong calling from the Lord to bring Charlie HOME (heaven) to be with HIM. I love each of you! With much prayer. With much love. With much faith. With much hope. With much joy and many tears. With great expectation. With great anticipation. We will be bringing Charlie home next week challenging his gut to nourish his body. With his line no longer being a good source of nourishment, we are asking God to resurrect Charlie’s body as we step forward and hope that his belly is capable of nourishing his sweet little frame. The doctors are not super optimistic but are helping us design the best plan to give Charlie the best possibility of being able to thrive by nourishing him through his belly. In order to execute this plan at home we will be set up with everything we need to give Charlie the very best shot at this. Charlie is feeling much better after beginning the correct anti-fungal drug to kill the fungus. He is playing in his bed throwing his toy balls around right now. Savannah will play with him today at the hospital so I can get some much needed rest at home. The right direction for Charlie is crystal clear. My flesh is weak, but my Jesus is strong. Please pray for us as we step forward each day, each moment, each decision. Please pray that we would have strength, hope, courage, and lots of love as we press forward. And so, with faith, we are asking God for another miracle. 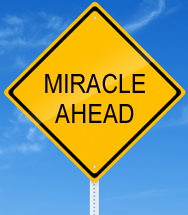 God is full of miracles and we know the Lord saved Charlie once, and we are asking Him to do it again! The clock is ticking and time is running out with Charlie’s IV feeds. If Charlie is to live, grow and thrive, his stomach needs heal. The Central line (IV port) is risky and its infections have been the cause of the last few hospitalizations. It has also believed that we are out of central line sites, so another infection could be hazardous. Also, his liver and heart can only bear the IV nutrition for a limited time before becoming destructive to those organs. We have tried many things to help heal Charlie’s stomach, but ultimately he needs a miracle. The Lord has been so good, so faithful, and so powerful in Charlie’s life. HE IS ABLE! Will you join us in asking the Lord for a miracle? Charlie is the Lord’s and we trust in HIM! We have been celebrating that Charlie has found the strength to bypass the trach and make loud and strong baby noises! We spent many weeks in the hospital in the months of November and December with line infections but the day we returned home from the hospital he began talking! I will never forget the last time I heard his voice and cry before he went in for his tracheostomy. It was a very hard day for this boy’s mama… But today we thank the Lord for growth, strength and progress! We recently made a change on his ventilator which was a wean towards taking him off the ventilator. In April there is one more wean to make and then we can begin taking off the ventilator for trial periods. At that time we will take a peek at his airway to see if it would be wise to take out the trach or not in the very near future. 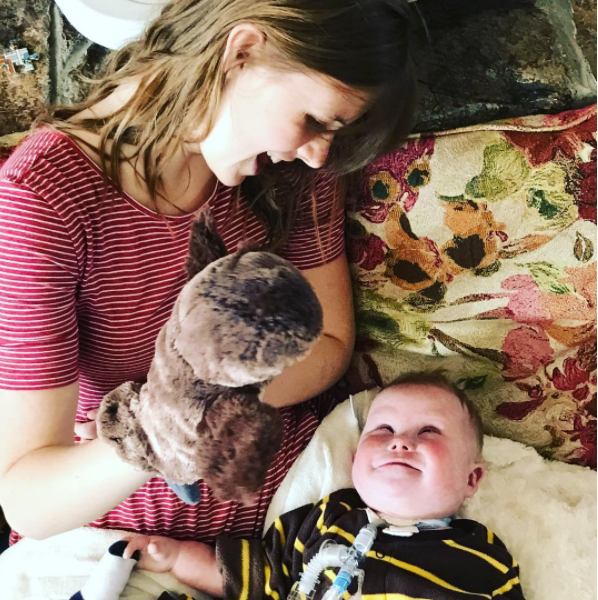 Many babies with Down syndrome have a more floppy airway and struggle with issues like sleep apnea etc.. We are hoping to find a strong and open airway that will allow the trach to come out sooner than later. success this week with speaking valve trials, progress with belly feeds, protection from infection, strength/perseverance/hope as our family loves and labors for Charlie. It has been a blessing to see some of our old NICU friends today. There is one family with a DS boy named Charlie, and his mom’s name is Debbie, its a fun similarity. Another little DS girl we know just went down for surgery to get an Ostomy and a few other things, she has a very sweet mom and dad that love her so much. We also saw a close (NICU) friend who’s one year old was sick. We love reuniting with these friends, it its fun to see how far they have come, and how much they have grown! Thank you for your continued prayers for Charlie’s gut to heal and absorb nutrients well so we can move towards removing this central line. Charlie has been so amazing! He is happy, playful, full of smiles, and SO cute! We were planning to go home today but the infection in his central line keeps persisting. The plan is to try to remove it the line tonight, and put a temporary line in until his body has a chance to heal, then they will put a new, more permanent line (like the one he has now) back in. The surgery would go smooth, and that the yeast would leave with the old line. We could go home soon. The doctors would start weaning his TPN (IV nutrition) so we can permanently remove the line. Thank you all for praying! We are trusting the Lord, and we know He has a plan for Charlie and our family. Happy Birthday Enid green bean- you are your nana’s namesake, and boy would you bring great delight to her! We love your SMILE and SERVANT’S HEART, you make everything fun. Fun celebrating our ‘bookend’ babies together!